BREVARD COUNTY, Florida - An operational audit published in January 2014 by the State of Florida Auditor General raised red flags about payments made by Brevard County Public Schools (BPS) to a software vendor because there was no documentation evidencing that BPS actually received deliverables from the vendor for those payments. "The District made payments of $600,000 and $2,250,000 in April and July 2013 based on a payment schedule. However, District records did not evidence the deliverables received for these payments," the 2014 audit noted. "Without documented receipt of deliverables before payments are made, the District may not receive all the services for which it was entitled." 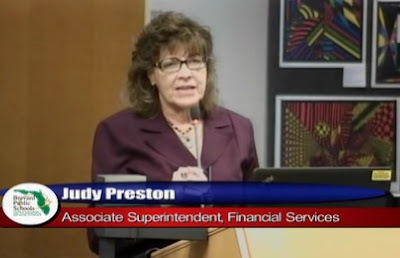 Despite those warnings raised by state auditors, BPS Assistant Superintendent of Finance, Judy Preston, continued to authorize payments totaling over $4 million to the software vendor, Educational Data Resources, LLC (EDR), in 2014 and 2015. Those payments were ultimately found to be improper by a second audit conducted in July 2015 by Widerman Malek, PL, a Melbourne-based law firm hired by BPS to conduct an external investigation, because EDR had failed to deliver the software to justify those payments. "Although we were provided a summary worksheet that identified the ERP implementation or maintenance costs for eight other school districts, the cost information was not current (the timing of these ERP implementations ranged from 1996 to 2005) and was not supported by documentation affirming the reliability and comparability of the cost information. District records provided for our review did not include current cost estimates for the desired system components and functionalities to be used in its direct negotiations with its existing ERP software provider. Given the extensive complexities and costs of ERP systems, utilizing independently developed cost estimates for the desired system components and functionalities along with the expected timeline for implementation and training would have provided more complete evidence upon which to negotiate for this procurement." "BPS has not conducted a cost/benefit analysis to determine whether the EDR LLC software upgrade is a sound investment decision. There appears to be no research done on alternative products to that of EDR LLC ... There is no apparent effort made by BPS to contact other potential suppliers to determine if there is a better solution available ... Based on information provided, BPS made a single contact outside of their district to Miami-Dade a handful of days prior to the software purchase appearing on the School Board’s agenda for vote. Our opinion is that this is woefully inadequate to justify an $8M agenda item expenditure." Although similar doubts regarding the contract were raised by both the Florida Auditor General and BPAC, former Brevard County School Superintendent, Brian Binggeli, remained defiant. "The District has noted the observations and recommendations of the Auditor General; however, the District reiterates that it was fully compliant with all legal requirements and acted in the best interest of District stakeholders regarding this strategic business decision," Binggeli wrote in a response to the state audit which was copied to all of the School Board members in January 2014. "The Auditor General agreed with the District that the State Board of Education Rule 6A-1.012(14), Florida Administrative Code, provides for the purchase of information technology systems software through direct negotiation and contract with a provider that best fits the District's needs, as determined by the School Board," Binggeli stated. "The District maintains that effective and appropriate due diligence was completed prior to making the decision to move forward with amending the current contract, ultimately extending the unique partnership with its current provider." "... I'm going to tell you that we made some implementation mistakes as we went forward. First of all, right out of the gate, we accepted and built a contract that was built as if the product was implementation-ready. Now, there were modules, they worked, but as you are going to see in a minute, you know if we truly were going to have something a robust K-12 Enterprise system, it wasn't implementation-ready. I talked to this with Gino [Butto, Assistant Superintendent of IT] a little bit. You know, what would have been more appropriate, of course, is a smaller amount up front, and then benchmarks, and, you know, product development, and targeted payoffs for those modules as they come on board. As opposed to, we paid a lot more up front. And then had to keep working to make sure. Even though the modules were there, there was going to be a lot of customization work that was going to be needed ..."
"Contracts should've been better. No question," Bingelli admitted later during the workshop.